The British government has for the first time directly accused Vladimir Putin of personally ordering the poisoning of a former spy in Salisbury, even as the Kremlin considered what retaliatory measures it would take to the ejecting of 23 Russian diplomats from the UK. Yesterday, British Foreign Secretary Boris Johnson made the incendiary claim that it was "overwhelmingly likely" that President Putin personally ordered the assassination attempt on Sergei Skripal using a Soviet-era nerve agent, an attack which left him and his daughter Yulia in a critical condition in hospital. Mr Johnson's comments, which appeared designed to show that Britain bears no ill will towards ordinary Russians, were denounced by Moscow as an "unforgivable breach of diplomatic etiquette". Mr Johnson said: "Our quarrel is with Putin's Kremlin, and with his decision - and we think it overwhelmingly likely that it was his decision - to direct the use of a nerve agent on the streets of the UK, on the streets of Europe, for the first time since World War II. That is why we are at odds with Russia." Presidential press-secretary Dmitry Peskov told the state-run Tass news agency: "We have already said on many levels that Russia has nothing to do with this story whatsoever. "Any reference or mention of our president in this connection is nothing but a shocking and unforgivable violation of the diplomatic rules of propriety." The British government has said it is "highly likely" that Russia was behind the attack, which used the "military grade" nerve agent Novichok, but until now has not directly suggested Mr Putin was personally responsible. Mr Peskov said it had become "obvious that there is a lack of any clear proof (of Russian involvement)". Referring to a joint statement of support from Britain's allies, he said the "whole wave (of such statements) originated from Britain". Russia has refused to explain how Novichok was used to strike down the Skripals on March 4. They were found unconscious on a bench and remain critically ill in hospital. Russia has demanded access to the case and opened its own investigation into the attempted murders yesterday. It said it would not respond to the UK's allegations until it was given samples of the poison used and such samples were handed to the international Organisation for the Prohibition of Chemical Weapons (OPCW). Downing Street announced yesterday evening that Britain had invited the OPCW's experts to "come to the UK and take a sample". A spokesperson said they expected this process to begin "imminently". 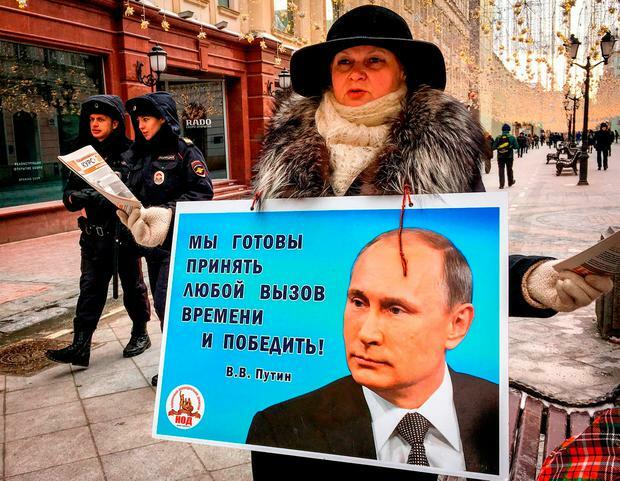 Mr Putin himself was focussed on his expected re-election as president, with yesterday the last day of campaigning. The issue of the poisoning was not raised during a public appearance at a medical centre in St Petersburg, his home city, and he used a TV address to urge Russians to turn out in high numbers. But in his daily conference call, Mr Peskov called Britain's allegations "against international law and common sense" and said the UK can expect Moscow's retaliation to come "at any moment". Foreign Minister Sergey Lavrov has already signalled that 23 British diplomats will be asked to leave the country, mirroring the British move against Russia's London embassy. But there has as yet been no other signal as to how Moscow will deal with the rest of the package announced by Prime Minster Theresa May on Wednesday. This included the promise to step up sanctions, a threat to freeze "hostile" Russian state assets, and a wider intention to work against "suspicious" Russian money in the UK. Mr Peskov said the Kremlin had been "surprised" by the British government's actions. "We haven't seen this type of behaviour on a state level before," he said. "Delivering serious accusations against… Russia, on a 'highly likely' basis, is both against international law and common sense." 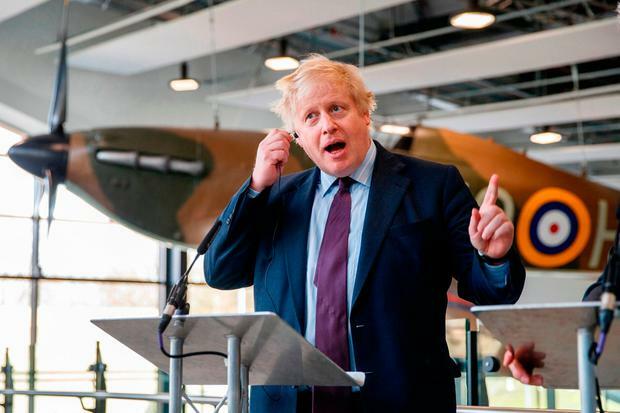 Mr Johnson's comments came as Russia was responding to the assertion from the UK foreign secretary's colleague, Defence Secretary Gavin Williamson, that Russia should "go away… it should shut up". Mr Lavrov said the comments suggested Mr Williamson "lacked education". Meanwhile, British police have said that another Russian exile, found dead at his home in south London on Monday, was murdered. Businessman Nikolay Glushkov (68), who was a vocal opponent of Mr Putin, died as a result of strangulation, according to a post mortem. A Scotland Yard spokesman said: "The Met Police's Counter Terrorism Command, which has led the investigation from the outset, is now treating Mr Glushkov's death as murder. "As a precaution, the command is retaining primacy for the investigation because of the associations Mr Glushkov is believed to have had." Mr Glushkov was the right-hand man of the deceased oligarch Boris Berezovsky, Mr Putin's one-time fiercest rival.